Not intended for use by persons under age 18. Do not exceed recommended dose. Get the consent of a licensed physician before using this product, especially if you are taking medication, have a medical condition, you are pregnant, nursing or thinking about becoming pregnant. KEEP THIS PRODUCT AND ALL SUPPLEMENTS OUT OF THE REACH OF CHILDREN. Caffeine warning: Do not consume caffeine, or combine with synephrine, including but not limited to coffee, tea, soda and other dietary supplements or medications containing phenylephrine or caffeine. Too much caffeine may cause nervousness, irritability, sleeplessness, and occasionally rapid heartbeat. Discontinue use if you experience dizziness, severe headache, rapid heartbeat or shortness of breath. Nonfat Dry Milk, Disodium Phosphate, Citric Acid, Natural and Artificial Flavors, Malic Acid, Fiber Blend (Cellulose Gum, Xanthan Gum, Carrageenan Gum), Sucralose, Acesulfame K, Silicon Dioxide, and FD&C Blue No. 1. Nonfat Dry Milk, Disodium Phosphate, Natural and Artificial Flavors, Citric Acid, Malic Acid, Fiber Blend (Cellulose Gum, Xanthan Gum, Carrageenan Gum), Sucralose, Acesulfame K, Silicon Dioxide, and FD&C Blue No. 40. 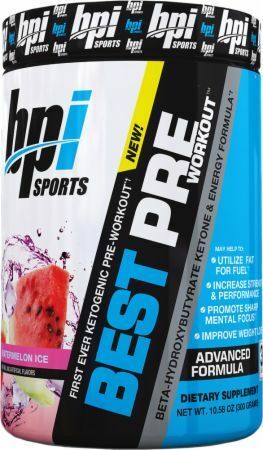 May 10, 2016 BPI Best PRE Workout – A Keto Diet Pre Workout? Note: Not to be confused with our Best Pre Workout Buyer's Guide! what's in best pre workout? That's why I co-founded BPI Sports. We aren't just about sports nutrition over here. We're a health and fitness company committed to excellence. We believe that the BEST Ingredients make the BEST Products. We are committed to helping you achieve your fitness goals with those high standards at heart. This is what drives the values of BPI Sports. We are committed to making sure that we deliver the absolute best nutritional products to you. Apple Pear This is a Buy 1 Get 1 FREE offer! Blue Lemon Ice This is a Buy 1 Get 1 FREE offer! Tropical Freeze This is a Buy 1 Get 1 FREE offer! Watermelon Ice This is a Buy 1 Get 1 FREE offer!